hi everyone! i know i've been a bad blogger lately but i've been super busy. i so look forward to checking in with you all on fridays and i promise to really catch up with you soon. 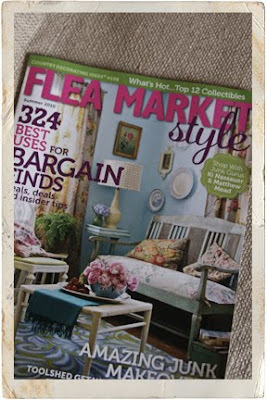 in the meantime today's project is an adorable idea from the new flea market style magazine and when i found it, i just had to create one immediately! flea market style creator ki nassauer has a whole fantastic article with the super creative sara smith and jane hall on what to do with old books and this handmade accordion file just has me smitten! -trim off the covers of your book, making sure to leave enough so that it will stay together. -fold each page into the center of the book, all going the same direction. 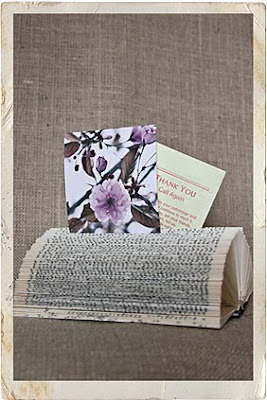 -once all your pages are folded you will have a cool accordion "file" to display photos and cute bits. today's friday creative is a home decor project that i've been meaning to get to for months now and i'm so excited about how it turned out! it's an idea that i've seen lots of places so i'm not sure who deserves original credit but thanks to them! 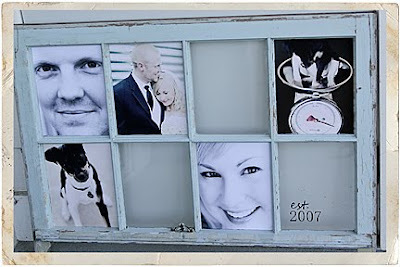 -cut photos to fit in window panes and adhere to front of glass. -and really that's it! isn't it cool?! i love mine, just have to get my hubby to hang it up. 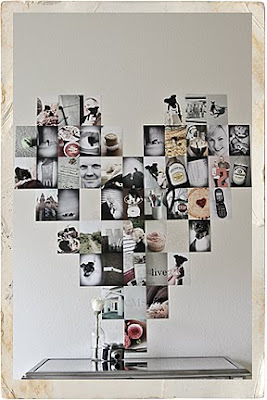 -arrange photos in heart shape on wall with removable tape. -note: i replaced 2 of my photos with a title card and a journaling card that has a list (really hard to see because silly me, made them the same color as my wall). so valentine's day is almost here and we have just one friday creative: love edition left. the last one is a great photo display, fun do as a surprise for someone you love...but since it falls just 2 days before the BIG day, i thought "homework" might help. to get ready, you will need 52 same-sized, vertical photos (i'd recommend 3.5x5s or 4x6s). your photos can be a fun collection of family photos you already have or you can take new ones. i'm doing a "things i love about our life together" theme for my hubby. you will also need removable double-sided tape and a blank wall to house your display. valentine's day is getting close and i'm really excited because i really do love this holiday! i hope you all are taking the time to shower the people you love with love (and photos and maybe a bit of sugar). and if you haven't started your valentines yet, today's project is for you! and there are 2 pdfs to help you get them done (see supplies). -valentines (find them here) or make your own, sized 3.5x8.75. -let's start with the valentine...print out and cut. next trim your photo to fit, 2.75x2.75 and adhere. easy right? -for the envelope, print out and cut around the outside edges. score the inside lines and fold envelope together (with printed lines on the inside) but do not adhere yet. 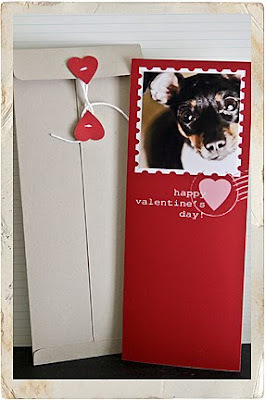 -before adhering envelope together, let's make the hearts closure (a super cute idea from miss martha). hand cut hearts or use the extras from the valentine pdf. poke two small holes through the heart and the envelope, sewing on, one heart on the top flap and one on the right flap. secure with a double knot on the back. -after hearts are stitched on, adhere envelope (remember to leave top flap open). -insert valentine and close envelope by wrapping a 10-inch length of floss in a figure-eight motion around the hearts. p.s. this envelope is sized to fit in a business envelope so you can mail to your sweeties!